3 What is the Auxiliary Port in a Car? 4 What is AUX Cable for? 5 How to Install Auxiliary Cable? Whether you are audio fanatic and music lover who has obsessed with crystal clear sound and audio technology or just a person who want to connect its phone with the car and play few tunes while driving, it is certain that you going to need some AUX cables. The auxiliary inputs or AUX is your common audio connection type which can be found in various cars, homes or professional applications. However, despite being common the AUX cable isn’t something you should take for granted and choose by price or length. No, there is much more to AUX cables than that and we are going to help you chose the best AUX cable by following these simple buying tips. USED FOR : iPods, iPhones or Media Players to car stereos or speakers. With appealing 2-year manufacturers warranty, iXCC AUX cable looks like the premium product with interesting features for the modest price. Modern design with heavy duty connectors (metal and gold-plated) and tangle-free function are good for any in-car user because the AUX cables always get tangle-up in the car and require a valuable time to untangle it before use. The cable itself is made from an extra thick rubber material which with big 3.5 mm jacks which fits nicely in hand during the plug-in procedure. This product also has a “step down“ feature which is good since almost all users have protective covers on their devices and longer jack is needed to fit perfectly and avoid any loss of sound. The iXCC 3.5 mm AUX cable is available in three different lengths (3,6,10 feet) but by user experience it is safe to say that the shortest and cheapest one is to be avoided since just under 1 meter in length is just not enough for average in-car user and definitely not enough for average home user, so if you are going to choose this product we recommend you go for a longer cable option. Another interesting alternative on AUX car and home cable market are Mediabridge 3.5mm Stereo Audio Cable. It is a regular “male to male“ stereo AUX cable with two notable features. One is the design of the jack which features a “step-down“ ring on the jack allowing plugs to be fully seated even when bulky protective cases are used which is very practical and needed feature since most smartphones and other devices are often in aftermarket cases causing problems with connection of jack and socket. Another worthy feature is the construction of the cable and beneath the soft PVC material, there is a braided copper shield and aluminum foil shield. All that with gold plated jacks guarantees clear sound and durability of the product. There is no problem with using Mediabridge 3.5mm Stereo Audio Cable with most of the popular products on the market and with the headphones since the innovative “step down“ design insures that the cable will fit anything with common 3.5 mm socket. This product is available in 4 different lengths (2,4,8 and 12 feet long) and it is a good buy with affordable price. The new FRiEQ 3.5mm AUX cable is interesting offering on today’s market and features both interesting design and quality materials. The length of the AUX cable is 1.2 meters (4 feet) which are enough for in-car use, however, it could be kind of short for home users. 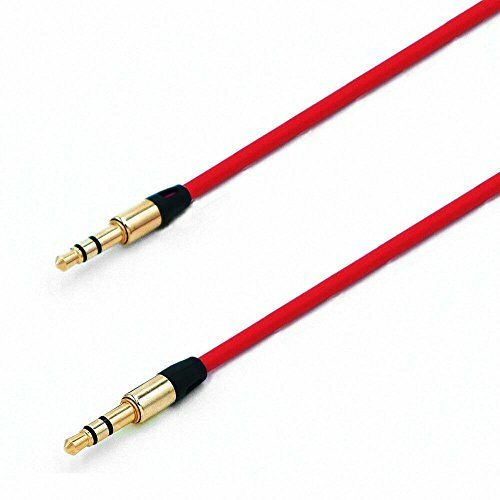 The main selling points of this cable are high-quality cloth in lively colors which surrounds the cable and is more durable and breaking prone than regular rubber ones and gold-plated jack for best available connectivity and clear sound. Also, this product has a “step down“ jack which is important for devices with protective covers since longer jack provides the best fit and connection. The jack itself has additional insulation which helps in the durability of the product during multiple plug-in and plug-out maneuvers and keeps the interference from other electrical devices in the car to minimum delivering best sound without losses. Affordable price and colorful appearance make this AUX cable interesting and appealing to in-car and home users which are looking for the quality product with good characteristics. Not to forget the 12-month manufacturer’s warranty. The innovative technology behind Anker’s 3.5 mm AUX cable offering puts this product high on the wishlist of any in-car or home user. The 24K gold-plated jacks are standard also the “step down“ jack layout, as well as the quality materials used in construction notably the kevlar compound used in making of the cover layer of the cable. The main advantage of kevlar is an incredible strength of the cable which is almost impossible to break and damage the copper threads inside. The product looks and feels premium with chrome plated jack covers, gold jacks, and matte black kevlar and rubber compound cable. The price is very affordable which makes this cable one of the best connection cable offerings on the market. The only problem is the length. It is available in only one dimension (4 feet – 1.2 meters) and while this could be just enough for in-car users it most definitely not enough for home users. The manufacturer declares the universal compatibility with all devices using regular 3.5 mm jack, but you must pay attention to the length of the “step down“ part of the jack since it could not fit the devices with extra thick protective covers. If you looking for a good AUX cable and perfect balance of quality and affordable price, the Sentey Black LS-6621 Audio Stereo Cable could be the product for you. It is a 6-foot long braided AUX cable compatible with practically all smartphones, tablets and media devices. However, it will not fit Sentey ThorX headphones and possibly some other types of headphones on the market so beware if you are buying this cable for that purpose. The highlight of this product is quality materials with a gold plated beveled connector for better connectivity and rust protection and strong materials with dual layer braided foil shielding. With this specification, you can be sure that this cable won’t break or stop working anytime soon and with 6 feet long (1.8 meters) it is long enough for most applications. The manufacturer is confident in their product so they offer 12 months warranty and 100% money-back guarantee which is good to know. 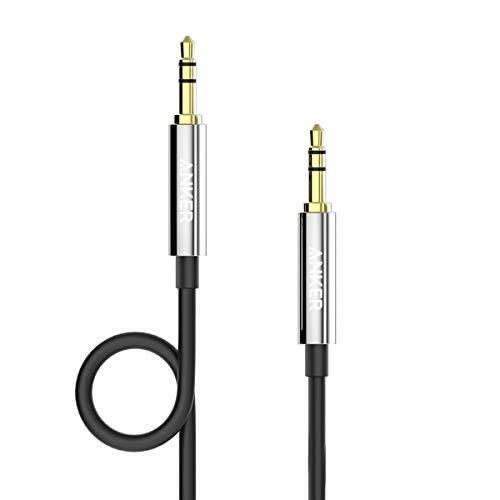 With an affordable price and good user reviews, the Sentey Black LS-6621 Audio Stereo Cable is something you should consider if you need a good and cheap AUX cable for your home or car. Here we have a product with a lifetime warranty given by Oldboytech. 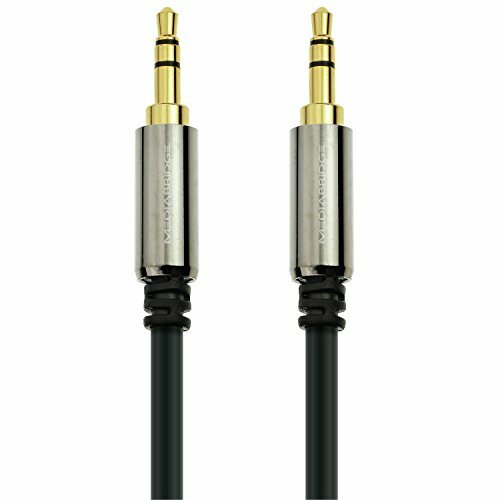 This male to male audio cable comes with a gold-plated jack that will match all of your electronic devices. But you have to make sure that they meet the 3.5mm audio port measurements. Also, the cable is made of a sturdy wire which means that it is durable and reliable. Moreover, the nylon-braided cord is double-secured to get you rid of the hassle of untangling the cable in the most inconvenient moment. As for the other advantages of this AUX cable, we can say that the 4-feet-long wire will be enough to easily connect your devices without worrying about distances. In addition, the plug can fit so well to, that even if you drop your phone by accident, it will stay plugged in. Overall, this is a great product which will surely give you a perfect connection and sound. But do not forget that even the manufacturer has listed some digital devices which will fit this AUX cable. What is more, this list does not include some of the latest iPhones like the X or 7 models. So, in this case you will have to spend more money and buy an adapter. The Vilight 3.5 mm AUX cable looks like the interesting alternative to other cables on the market, mainly because of its lively red color and good quality materials used in construction. The cable itself is made from high strength rubber compound with HQ OFC conductor inside and (LDPE)/PVC inner insulation. The jacks are gold-plated which is the industry’s standard. However, this product lacks a “step down“ feature which could be a problem connecting with devices with thick protective covers or headphones so check the dimensions first to avoid being not satisfied with this product. The other possible problem is a length of the cable and it is only available as 3 feet long (90 cm) and it is safe to say that is not so good for in-car use and certainly not enough for home audio systems. 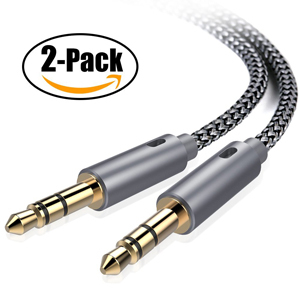 The price is affordable and the sound quality is great, thanks to good materials used in the making of the cable but you can do better in terms of practicality for that kind of money. Of course, if red is your color and it matches the color of your car interior and you don’t have a problem with short length, this product could be the one for you. We know that not everybody is the technical nerd but there are some technical things every AUX cable user should know about. First, the construction of the cable and basically AUX cable is two wires individually wrapped in protective shield undercover foil. But there is a difference in construction. Better cables have more insulation layers and better materials and one important feature – they are oxygen free. Maybe it sounds funny but a regular cable with oxygen inside is not so good since molecules of air inside of cable can cause static electricity which transfers as interference and loss of signal. So always chose an oxygen-free cable (this is the industry’s standard) which are signal-loss proof. Despite the fact that every cable uses the copper wires not every type of copper is the same. The better and the cleaner the compound is the better is the cable. And we are not talking just the better sound or lack of humming noises. No, we are talking security. Cables with cheaper compounds of copper are very prone to heating since the electric signals which runs through them heat the cable. Sometimes, if the cable is really bad it can even cause a meltdown and in the worst case scenario, a fire. Whenever you see that cable is hot, replace them. It is always cheaper to do that than to cover the damage. Good quality cables don’t get warm any matter how long you use them and the best materials make the best cable available. Don’t look at the price as the only aspect of your purchase and don’t buy the cheapest product on the market. For just a little bit more money you can have a much better AUX cable which will last you longer and be safer to use. Better and more expensive cable is always a better option since it improves the sound of the music and reduces the background noise from your car’s other electrical systems. Always buy a longer cable than you currently need. It is wise to approach since the longer cable gives you more room to maneuver in your car. Always check the compatibility of the cable with your current devices. Since the 3.5 mm socket is standard it is safe to say that almost any cable will fit but sometimes you need to be extra sure since devices can have thick protective covers which will make problems if the jack is shorter. Especially pay attention to headphones if you are planning to use them. Try to keep your car AUX cables rolled up and safely stored when they are not in use. That will keep them in working order for longer and avoid breaking of the cable. If you bend the cable too much it could break the copper wire threads inside and cause loss of contact, sound interference, and heating of the cable. What is the Auxiliary Port in a Car? 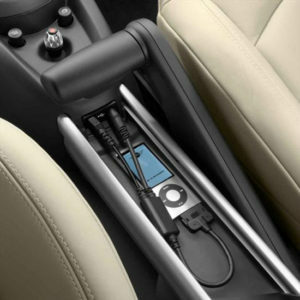 Auxiliary inputs or AUX is basic audio connection socket for your car by which you can connect external devices (phone or tablet or any media device) and play them through speakers in your car. 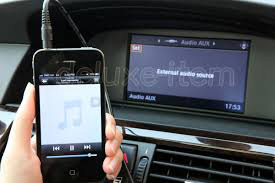 It is the easiest and best ways to play music from your phone or another device by simply plugging the cable into AUX socket which is located on the dashboard, armrest or glovebox. There are two basic types of AUX sockets. 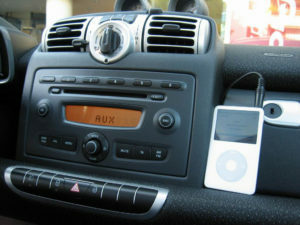 The most common and recognizable are single 3.5 mm AUX socket and RCA AUX socket which has two inputs in a different color (often one red and one white). The regular single 3.5 mm AUX input is the industry’s standard form 2007 up to this day and can be found in all kinds of vehicles as standard equipment. The RCA AUX type of input is rarer and it’s used just by some manufacturers. However, it will not fit Sentey ThorX headphones and possibly some other types of headphones on the market so beware if you are buying this cable for that purpose. Highlights of this product are quality materials with a gold plated beveled connector for better connectivity and rust protection and strong materials with dual layer braided foil shielding. With this specification, you can be sure that this cable won’t break or stop working anytime soon and with 6 feet long (1.8 meters) it is long enough for most applications. The manufacturer is confident in their product so they offer 12 months warranty and 100% money-back guarantee which is good to know. 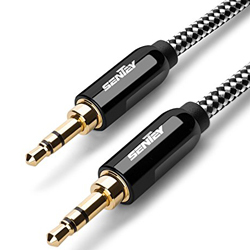 With an affordable price and good user reviews, the Sentey Black LS-6621 Audio Stereo Cable is something you should consider if you need a good and cheap AUX cable for your home or car. Another interesting alternative to AUX car and home cable market are Mediabridge 3.5mm Stereo Audio Cable. It is a regular “male to male“ stereo AUX cable with two notable features. One is the design of the jack which features a “step down“ ring on the jack allowing plugs to be fully seated even when bulky protective cases are used which is very practical and needed feature since most smartphones and other devices are often in aftermarket cases causing problems with connection of jack and socket. Another worthy feature is the construction of the cable and beneath the soft PVC material, there is a braided copper shield and aluminum foil shield. All that with gold plated jacks guarantees clear sound and durability of the product. There is no problem with using Mediabridge 3.5mm Stereo Audio Cable with most of the popular products on the market and with the headphones since the innovative “step down“ design ensures that the cable will fit anything with common 3.5 mm socket. This product is available in 4 different lengths (2,4,8 and 12 feet long) and it is a good buy with affordable price. What is AUX Cable for? Industry’s standard for almost 10 years, AUX sockets on the dashboard or in the glovebox of your car are the perfect solution for connecting your mobile phone or tablet. It is by far the best and simplest solution for playing music or having voice input from external navigation systems. All you need to do is to choose the best connection cord and you are good to go. Most of the AUX sockets are standard 3.5 mm single ones but some manufacturers offer RCA AUX socket which has two inputs in a different color. There are a lot of different products on the market but they are all affordable and you can choose between different lengths, specifications, and even colors. In order to get the best performance from your cable, you should follow our buying guide which explains everything you should know about choosing the best cord for you. You should know the difference between AUX socket and USB port and AUX is only for connecting your phone or media device, not a port for connecting your external memory stick. Beside connecting your phone or tablet, AUX cables are also used for connecting various audio equipment and headphones. All of this makes AUX cord very practical addition to your car and must for any car audio enthusiast which wants to play his favorite tunes right from his phone playlist. Since these types of cables are the industry’s standard for quite some time you don’t have to worry about compatibility issues with different devices and every cable should fit perfectly. Since the prices of most AUX cables are within the reach of almost any car and audio fan, there is no excuse not to buy this small but valuable piece of car equipment and start enjoying music in your car in whole another level. How to Install Auxiliary Cable? 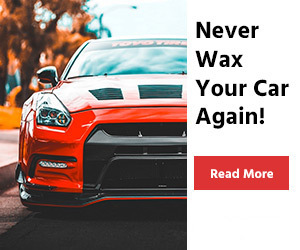 Since the AUX cable is a simple yet effective and practical piece of in-car audio equipment it is very simple to install connection cord in your car. 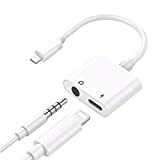 The most common type – single 3.5 mm jack AUX cable is extremely simple to use and all you need to do is to plug one end to you in-car AUX socket and other to your phone or mobile device and you are good to go. 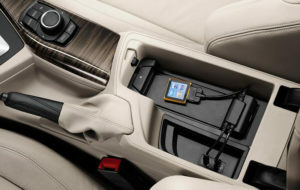 The car hardware and mobile device will recognize the connection and in just a few moments you should be able to use it. There are a lot of products on the market and all of them should fit all devices, however, some of the products available are from less known manufacturers with lower standards so fit and finish of the AUX cables are less than ideal. In those cases, jack will not fit the socket perfectly and you will experience bad connections, weak signals or static interference. Of course, you should avoid this product and check our list of the best cables for you. Besides the regular 3.5 mm AUX cable, there is an RCA AUX socket which has two inputs in a different color (usually red and white). 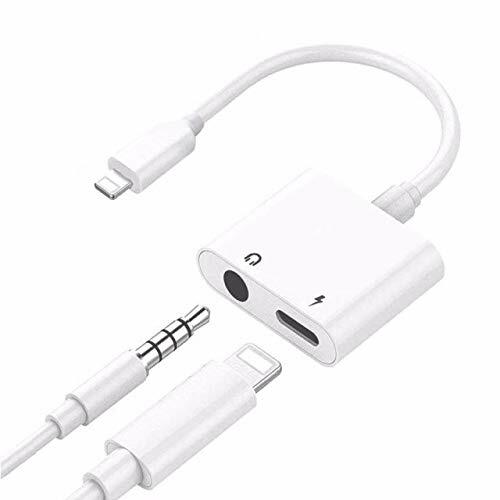 This type of AUX cable has the same function as the regular one but is used if you want to connect more complicated devices which could play video files to your in-car video screens. The reason for two sockets instead of one like on 3.5 mm is because there are two types of impulses which run through the cable, one audio, and one video. The connecting procedure with this type of cable is also very simple, just connect the jack with the same color rings as the sockets and that is it. In case that you have one type connection socket on your car and other on your device (or vice versa) there are cables on the market with one type of jack on one end and another type on another end so every situation is covered. That is why you should choose the best cable for you and start listening to some more music while your driving. You may also like: What is the Best Touch Screen Car Stereo? 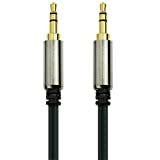 MEDIABRIDGE 3.5MM AUDIO CABLE $$ 3.7 x 0.8 x 3 inches High Quality Polished Metal Connectors with Gold Plated iPods, iPhones or Media Players to car stereos or speakers. The AUX cable is a must for any in-car or home user and there is a wide selection of different product on today’s market. 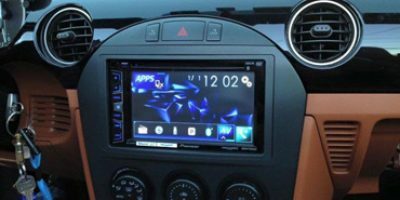 You can choose between different specifications, colors or materials but there is no better or simpler way to connect any mobile device to your car stereo system. 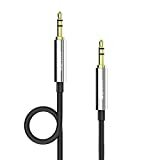 Whether you are a music lover who wants to connect the phone or just a person who needs vocal navigation instructions, connection cable like this is a regular part of car equipment. 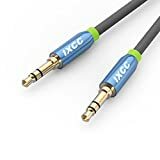 So to chose the best AUX cable for you and have full satisfaction with the product and its performance, check out reviews and guides to the world of AUX cables and you’ll find everything you need. We hope you found AUX cable reviews useful and welcome your comments.